Air Force quarterback Arion Worthman, front, runs as Stony Brook linebacker Keegan Henderson, center, and defensive lineman Brandon Lopez pursue in the first half. Air Force defensive back Robert Bullard, right, drags down Stony Brook wide receiver Marshall Ellick after he caught a pass in the first half Saturday. Stony Brook linebacker Noah McGinty, left, drags down Air Force wide receiver Marcus Bennett. 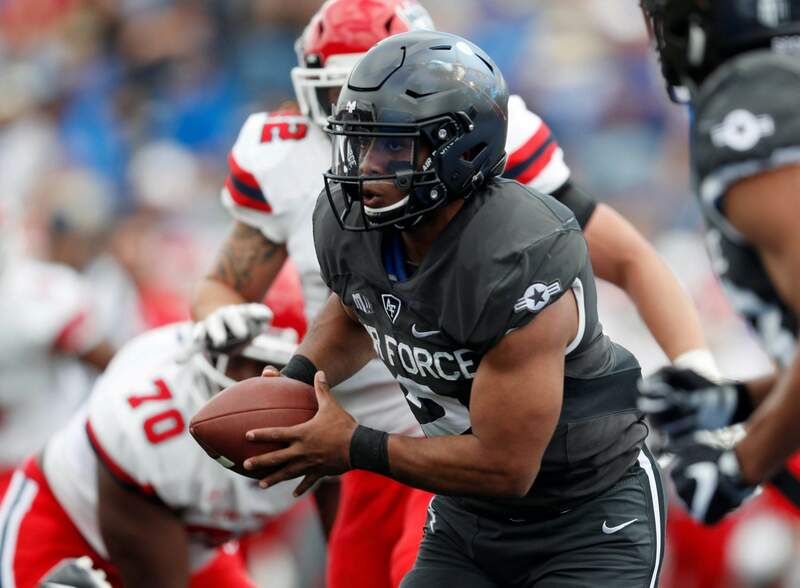 AIR FORCE ACADEMY – Linebacker Kyle Johnson’s early pick got the ball rolling for the defense. 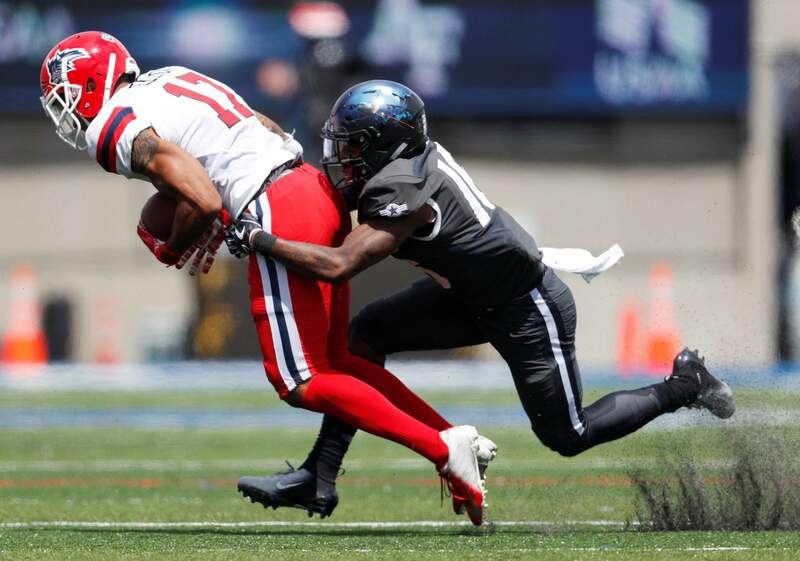 Johnson returned an interception 32 yards for a score as a stingy Air Force defense limited Stony Brook’s offense to 75 total yards, helping the Falcons to a 38-0 win on Saturday during a game delayed twice by lightning. 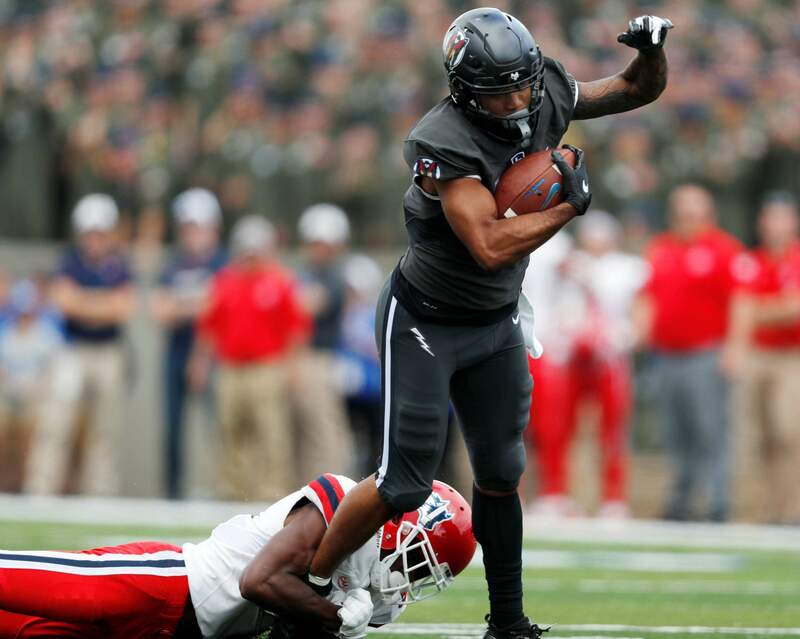 It was the second-fewest yards ever by an opponent against Air Force in the Academy’s history. The record low was 66 from San Diego in 1956. Johnson actually scored a TD in practice during the week. But that came on a punt block and to celebrate he flipped the ball over the goal post. He wasn’t about to do that in a game. Quite a few of the fans at Falcon Stadium headed to the parking lot during the first delay and didn’t return. Stony Brook: The team drops to 7-5 all-time against the United States Military Academies. The Seawolves knocked off Army 23-3 in 2012. They’re also 3-0 against the Coast Guard Academy and 3-4 versus the Merchant Marine Academy. CUSHY DELAYThe renovated Air Force locker room came in handy for the delays. HARSHEST CRITICWorthman wasn’t pleased with his performance. He rushed for 66 yards and fumbled. He also was 2 of 8 for 29 yards through the air.